What can be suggested to a person who is completely bald and wishes to have his hair back? 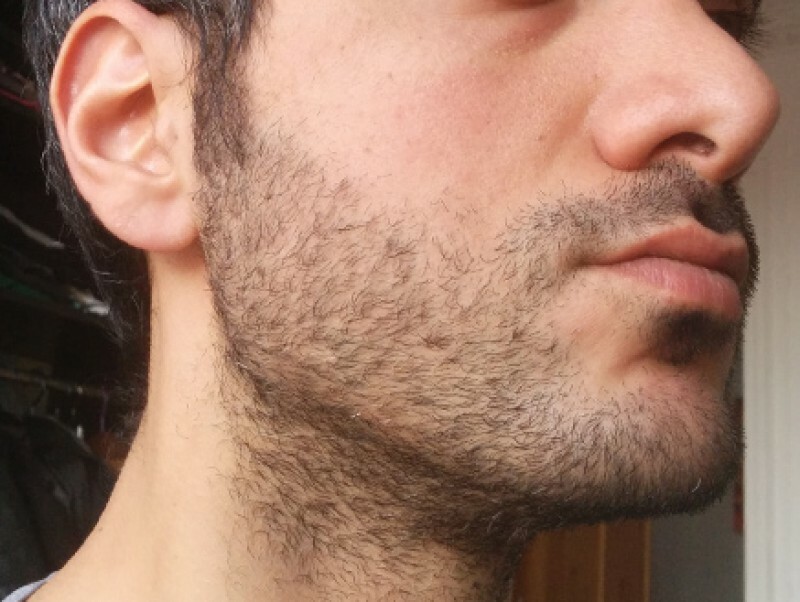 Two solutions can be suggested: either a permanent aesthetic hair restoration technique such as the use of micrografts or a 'non-lasting' proceeding like wearing a hairpiece. What is the purpose of hair replacement surgery? All the methods used so far attempt to distribute the definitive hair harvested from the crown over the balding areas in the most aesthetic and harmonious ways possible. The choice of the technique will depend on several medical, surgical, biological and psychological factors. The use of Bouhanna's multifactorial classification is always recommended. Moreover, it is based upon the aesthetic requirements determined by the specialist and the aesthetic wishes of the patient itself. What do these different surgeries consist of ? Long hair grafts (Bouhanna) are identical to micrografts but with the advantage of hiding the transplanted areas on the same day of surgery, due to the length of implanted hairs. Do micrografts always 'regrow' ? Yes, but this is difficult to assess as it is mostly linked to the blood supply of the scalp which varies from person to person. Nevertheless, studies done to understand this varying factor, and advances made in the instruments themselves, have rendered this technique perfectly reliable. Is there any hair grafts rejection? Contrary to the majority of organ transplants (heart, lungs, etc), hair grafts are done with the patient's own hair. Therefore, the implanted grafts will never be rejected. However, in rare cases, poor grafts vascularization can occur. As a matter of fact, we have carefully studied this poor vascular supply in order to find a quick solution to this problem. Can hair from another person be grafted ? The idea that an individual could benefit from hair donation is conceivable. However, the study of the immunological histocompatibility system is so complex and costly, that at present it is impossible to imagine such an outcome. Can women benefit from micrografts transplantation? Women have benefited the most from the huge progress done in micrografts transplantation technique. However it is the only recommended proceeding used for this type of alopecia. We have seen that women suffer from a different type of baldness than men. What are the different steps of female hair transplant surgery? The area to be implanted is drawn on the scalp. Then, patient looks up in a mirror if this suits her. An anaesthetising gel is applied to the forehead and the nape to render local anaesthesia painless. 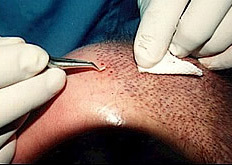 A strip of hairs is harvested from the nape. The donor area is stapled or sutured to obtain a thin linear scar. 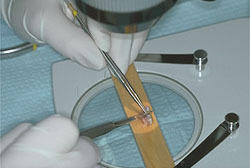 The strip of hair is cut with a surgical blade under magnifying glasses, into 300 to 1000 micrografts. Multiple tiny punctures are made on the recipient area with a microsurgical instrument. Then micrografts are individually inserted with jewellery forceps into the holes. This surgical operation, which is virtually painless, lasts between 2 to 4 hours. 1000 to 3000 hairs can be transplanted in one session. When the operation is over, patient rests for 1 hour. The transplanted area is checked over with a magnifying glass before combing hairs and sending patient back home. On the following morning, the lady is able to get her first shampoo with an adequate antiseptic liquid soap then she usually goes back to work. Can micrografts be used to correct balding of Black women with braided or straightened hair? This problem is a frequent motive of consultation. As a first step and for sixth months, either minoxidil solution or colostrum or karite creams should be prescribed. Patient must above all stop all kinds of hairstyles which exert a strong traction on hair. If regrowth is insufficient, then one or two sessions of micrografts are needed. As a matter of fact, micrografts used for Black patients can be slightly larger and contain 3 to 4 hairs without detracting from the aesthetic result. Are the scabs which appear on the micrografts embarrassing aesthetically speaking ? The scabs which last between eight to twelve days are not so unsightly except for the front. 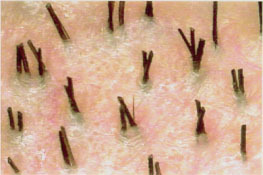 This problem can be avoided with the long hair graft technique as the area is hidden by the newly transplanted hairs. What can be thought about automatic hair implanters? Several automatic hair implanters have been tested so far such as five CarrouselRM, or the CalvitronRM, but they did not give any conclusive evidence. Markman implanter, a new hair transplant device is still under study controls. Why has laser no benefit for hair transplant surgery? Lasers such as CO2 and Erbium were expected to drill bloodless holes in the recipient area, where micrografts can be transplanted easily. However, this gain of time is unfortunately done at the expense of the healing process which is obviously retarded. Therefore, hair regrowth is of a lesser good quality. What kind of care should be given after micrografts transplantation? Post - operative care is made simple. Bandage can be avoided and a shampoo is done the following day with the patient returning to work. What happens to micrografts a few years later? Harvesting performed from the hairy area. This corresponds to the crown in men, and above the nape in women. This is why grafted hairs persist and are constantly renewed during all patient's life span. Shall we get better aesthetic results on hair by combining minigrafts and micrografts to minoxidil and finasteride? We have suggested in recent publications to combine micrografts with local application of 5% minoxidil solution and oral administration of 1 mg finasteride for men. Furthermore, we advocated the combination of micrografts to the local application of 2% minoxidil for women. Is it possible to create a natural frontal hairline in one session? Yes, it is possible to create a natural frontal hairline in one session. Keys for a successful hairline placement are : harmony, respect of face proportions, a more or less symmetrical hairline on both sides, an oval and soft (round for Afro-Americans) hairline design and well defined fronto-temporal angles. Surgeon must spread definite micrografts size on specific locations. The finer one-hair micrografts are placed in the most anterior zone and the larger two-to-three-hair micrografts in the mid central portion of hairline. The goal of this technique is to get a natural hairline in one session using micrografts. These are skillfully placed to produce deliberately an irregular and soft hairline with the illusion of creating density. Is post-operative care easy to perform? Follow-up of this surgery is very easy and a dressing is put for 6 to 24 hours. The patient is able to wash his hair the next day with an antiseptic shampoo and return to his private life. Shampoo is done first every day for one week, then every 2 or 3 days. Suture and staples are removed from the donor area, 12 days later. Is it true that one can travel back home the same day? Of course, but with the use of a little bandage or by wearing a cap. Are we able to resume work the following day? It is in fact possible to go back to work or social life one to two days later. Sometimes a frontal odema may appear and lasts for two to three days. This will recede quickly due to the local application of ice or massage. How are face lift scars repaired? Scars due to face lift need a reconstruction of the pre-temporal area and the anterior frontal hairline. Transplanted Micrografts must be as thin as possible with hairs obliquely oriented. Is it possible to transplant hair elsewhere than the scalp? What are the prospects from a therapeutic point of view about hair culture? 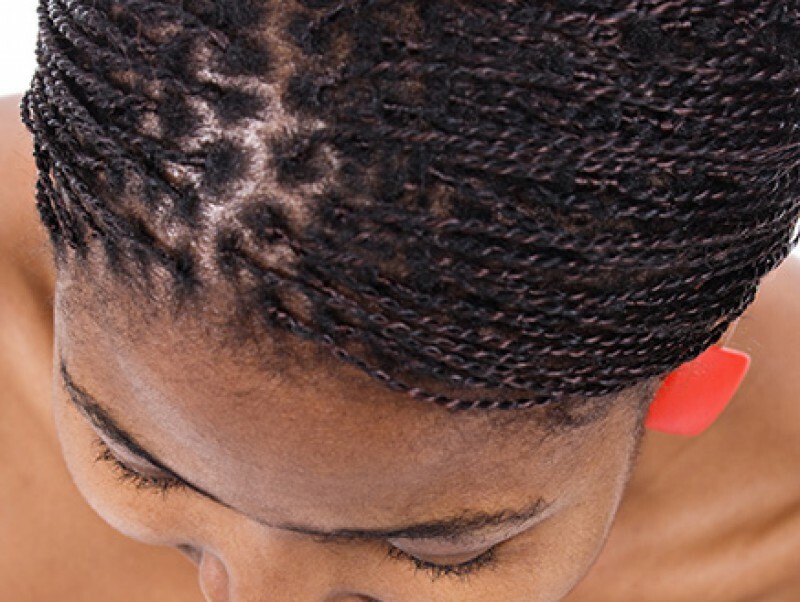 Hair can be put in culture just like skin cells. Therefore, cultured hair bulbs will give rise to hair shaft keratin. This worldwide proceeding, allows to test the effects of certain drug molecules on hair growth. A recent study demonstrated that it is possible to put in culture external hair root sheaths. After five weeks of culture, a 360 m2 sheet of hair cells is obtained. It was used to cover up large areas of scalp burns (Kurata, 1994). However, it is impossible today to predict when it will be used for surgical purposes.